We learned about “discovering a position”, a basic feature of Fritz13’s “Let’s Check” analysis system in the last blog post. This time around in USCFSales’ blog we’ll tackle another “Let’s Check” feature: analysis of complete games. First we need to take a little side jaunt to explain another piece of “Let’s Check” terminology: the idea of “winning” or “conquering” a position (you’ll see both words used more or less interchangably). If you decide to have your engine analyze a position and, after you log on to the “Let’s Check” server, you see that someone else has already analyzed it, you can still get point credit for contributing your own analysis if you “win” the position. This requires you to have your engine analyze the position to a much greater depth than did the already-listed engine (and, honestly, if you’re running a single-core chess engine, this may well require that you run an analysis of several hours on just that one single position). Every move which has already been analyzed by a user has analysis attached to it. 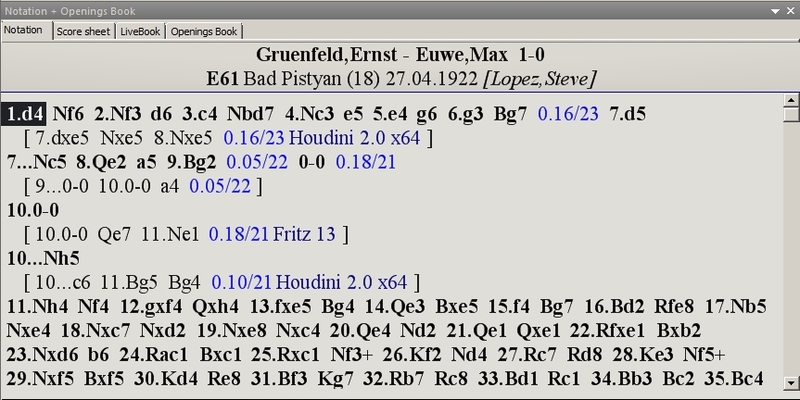 The analysis displayed includes a three ply variation, the numerical evaluation (shown from White’s perspective, negative numbers therefore indicate a Black advantage), and the name of the chess engine which created the analysis. If you’ve checked the “User names” box in the initial dialogue, the names of the users who have discovered or won the positions will be displayed. 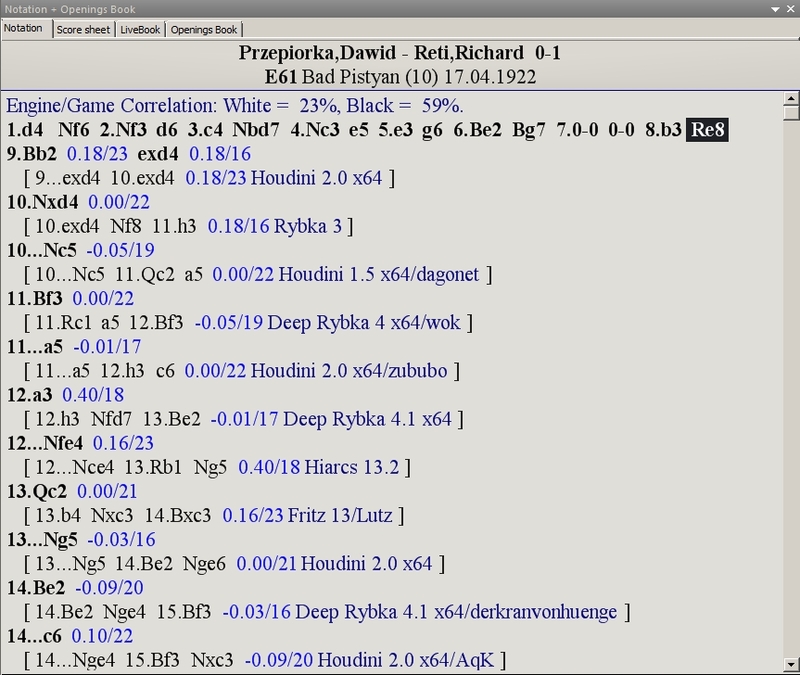 In the illustration above, none of the positions show user names; this means either that the analysis was performed anonymously (which seems to be the case with a couple of these moves, as they display 20+ ply searches) or that the analysis wasn’t deep enough to allow the user to “discover” the position. In the above illustration, few of the positions have analysis attached to them – yet. Over time, as more and more users contribute analysis to the “Let’s Check” server, the “Retrieval” form of analysis will become a more valuable tool and a huge time-saver; we’ll show a graphic illustration later in this article. The second analysis form in the “Let’s Check analysis” dialogue is “Standard analysis”. Selecting this option means that your own chess engine will analyze each move in the game and will contribute its own analysis to the “Let’s Check” server. If no analysis of the position already exists on the server, you can possibly “discover” positions as the analysis progresses (although this can be very time consuming – a typical “discovery” analysis using a multi-processor engine on a dual core computer takes about seven to eight minutes per position on average; as always, your results may vary somewhat depending on the hardware used). 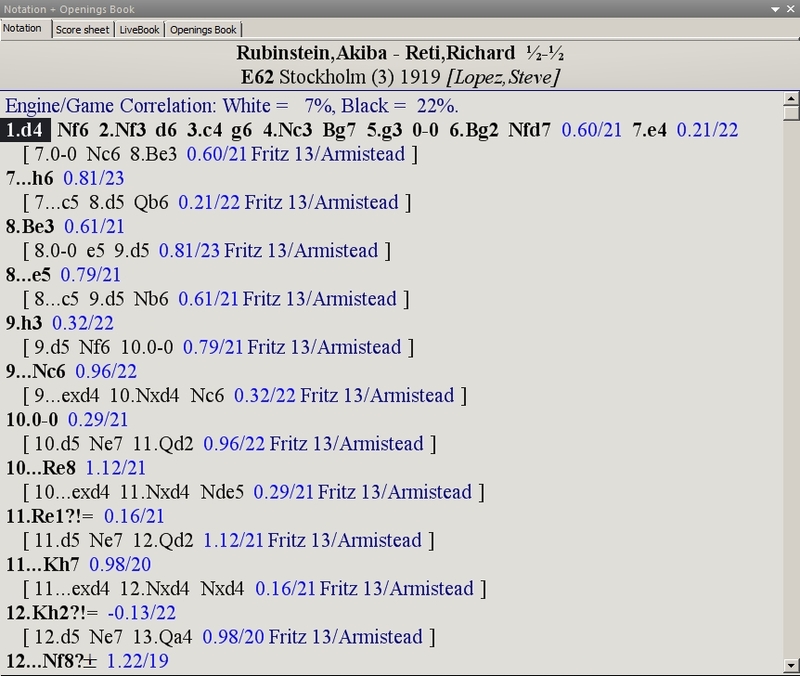 Notice, too, that the Playchess user names are in this case appended to each bit of analysis. 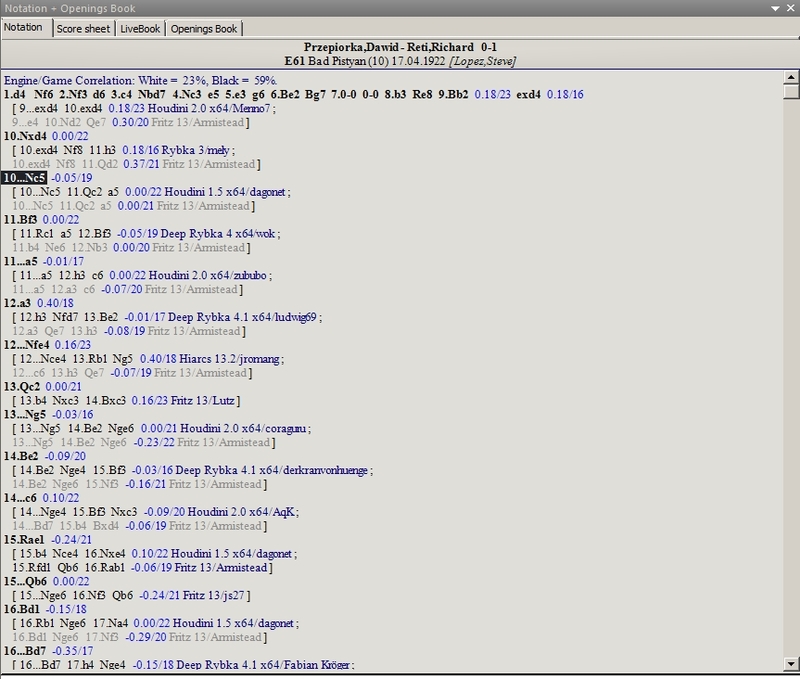 We’re provided with a comparison of how well the moves suggested by the chess engine match the players’ actual moves. In this case, the engine’s suggestions agree with 23% of White’s choices and with 59% of Black’s moves (which is not surprising, given that Black won the game). The software took about twenty seconds, give or take, to come up with what we see in the above illustration, graphically demonstrating what a time saver this will be after many thousands of positions are analyzed by “Let’s Check” users. Since the game’s positions had not previously been analyzed by other users, only my engines’ analysis is displayed. The third “Let’s Check” analysis form is “Win Variations”. In this case, each position will be analyzed to a depth sufficient for you to either “discover” the position (if no one has yet analyzed it) or for you to “win” an already-analyzed position (assuming your “time” settings are high enough). Note that this can potentially be very time-consuming and is best suited for users who are running multi-processor chess engines on a multi-processor/multi-core computer. In this case you’d want to set a high “Minimal” value (perhaps “600” [ten minutes]) and a very high “Maximal” value (“900” [fifteen minutes] or more). If you’re the first to analyze a position, you’ll be credited as the position’s “discoverer”. If you’re not the first to analyze the position, you’ll score points for “winning” the position if your engine’s search depth is significantly deeper than the deepest existing search attached to that position. Note that when you set a really high “Maximal” time setting, your engine won’t necessarily analyze for that full time period – only long enough to either “discover” or “win” a position, after which the engine will move to the next position and begin to analyze it. One last setting should be mentioned: the “Text comments” box. The “Let’s Check” server allows users to manually attach text notes to a position. 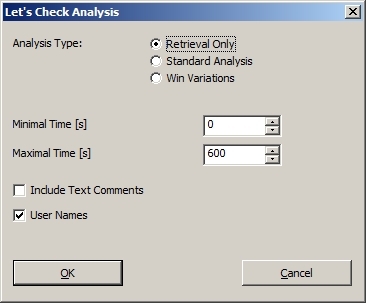 If this box is checked, other users’ text notes will be displayed in the analysis output.